Diesmal spielten wir Epic Duels zu sechst in der Variante "dunkle" gegen "gute" Macht, d.h. es spielten 3 (Walter, Basti, Hans) die gute Seite und 3 (Peter, Moritz und ich) die dunkle Seite. Peter begann das Spiel und hatte mit dem Imperator gleich gute Spezialkarten zur Verfügung, die er sofort gegen Walter einsetzte. Der verlor damit alle seine Handkarten und war schutzlos, ohne überhaupt am Zug gewesen zu sein. Als Peter dann in seinem zweiten Zug dies ausnutzte, um Walters ersten Charakter zu töten stand Walters Meinung über das Spiel fest: keine Möglichkeit, das Spiel zu beeinflussen - man wird gespielt. Hier spielte sicherlich eine Rolle, dass wir zu wenig als Team spielten, um uns gegenseitig zu schützen. Die übrigen Spieler lieferten sich einen spannenden Kampf, der letztendlich nach 30 Minuten Gesamtspielzeit mit dem Sieg Peters und damit der dunklen Seite der Macht endete. Bis auf Walter waren alle der Meinung, dass "Epic Duels" ein spannendes, kurzweiliges und sehr stimmiges Spiel mit ausgewogenen Charakteren ist, das wir gerne wieder spielen werden. 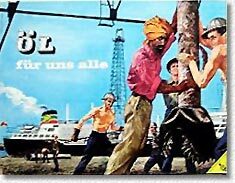 In the 1960s I played this game quite often and I remember that I liked it a lot at the time. 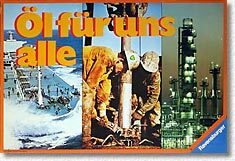 Ravensburger published the first release in 1960 (apparently in co-operation with British Petrol) and decided to re-release it in 1976. The second issue came with large separate boards for the oil drilling and market value markers but overall I liked the 1960 material better - it delivered a less abstract flair to the game (I particularly liked the little oil drilling towers, which although a bit fiddley to use were a lot nicer than the abstract plastic pawns used in the 1976 release). We played the 1976 release of Hans, who has equally good memories about the game as I have. Basically, this a business game about oil exploration and transportation. 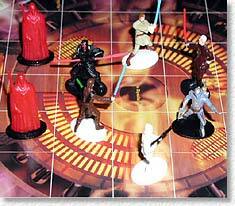 Players roll a die to move their pawn across a track on the main board. The space they end their move on indicates an action they can or must make. Some spaces trigger actions just when moved over - these actions apply to all players. Possible actions of the first kind are buying the next available oil drilling right and to start drilling for oil, or to take one of the two kinds of event cards. A possible action of the second kind is that all oil wells belonging to players produce oil, which increases the level of oil in the storage tanks of each well. Once a player has moved his/her pawn (s)he may charter a tanker to transport oil from a well's storage tanks to a refinery. Two types of tankers with different capacity (and charter price) are available and no ship may be chartered if there is insufficient oil to completely fill it. Tankers move one space across the world map on the board per player's turn. Shipping routes have different length depending on the location of the well and the chosen refinery. Whenever a ship moves the owner has to pay operating costs, which are on top of the initial charter cost for the tanker, making it important to always have sufficient money available - so players have to carefully watch their cash flow. Once a ship reaches its destination the refinery pays the current market price for that location and the price drops one step thereafter. This is a simple mechanism to simulate supply and demand. Players start with one working oil well and may start as many oil drilling operations as they like - provided they end their move on the appropriate space and have sufficient money to buy the exploration rights. Drilling for oil is a chancy business and will fail or incur additional costs in about 40% of the cases. The game ends once the first player has successfully completed 10 oil deliveries to the refineries. Fata Morgana, the publisher of this game is best known in the English speaking parts of the world by their game Kreml, which was published in English with slightly modified rules by Avalon Hill under the name of "Kremlin". Many Fata Morgana games are card games (like their famous "Anno Domini" and "Tichu") and "Der wahre Walter", too, comes as a set of 156 cards with 3 statements each on either side of the card. Each of the statements refers to the person reading it to the others (the Sphinx). A keyword of a statement is blanked out by the word "Walter". The game works like this: in sequence each player for one turn resembles the "Sphinx", takes the next card from the shuffled deck, selects one side of the card and reads the 3 statements to the other players. Example: "Having won a million in the lottery I would Walter." Using their knowledge about the person playing the Sphinx the players (including the Sphinx) write down what they think is the most appropriate replacement for the word "Walter". This can be a single word up to a complete sentence. Once all players have written down their "Walter" words the Sphinx collects all notes and reads them (including her own) in random order to the players. The players (of course excluding the Sphinx) then guess what the Sphinx's "Walter" words might have been. Players who guessed correctly receive a point (the Sphinx also receives a point for each correct guess of another player). In case a player guessed wrong the player who wrote down this (incorrect) word receives a point. 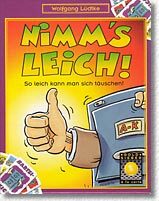 Basically the game implements the same principles as the lexicon game or the German "Nobody is perfect". The only difference is the more personal touch by having to guess what the Sphinx will write down. The Sphinx will try to write down something that is likely to be guessed by the others and the other players will try to write down words which sound convincing to all other players in order to trick them into selecting this word. So it is of some benefit to know the person that plays the Sphinx quite well. All of this is by no means a new idea or principle - it works fine all right but does not have a "lasting effect". The game uses 6 different "Leich" cards which are shuffled and placed face up in a line on the table. One end of the line is marked as "top" by turning the card (the highest ranking "Leich") by 90 degrees. Each player receives 6 cards from a deck of 36. Each of these cards has 6 spaces for a representation of a "Leich" card. The distribution of "Leich" pictograms on these cards varies significantly, some show only 2 different "Leichs" but each of them 3 times. Others show 3 "Leichs" each of them twice and so on. Each player takes the first card of his/her deck (which lies face down in front of the player) and the task of the players is to make a bet on how many "Leichs" of a particular kind are represented in total on all of the players drawn top cards. The start player makes the first bet. The next player now has three choices: either raising the bet for that "Leich" by at least one, or quoting a new bet for a higher-ranking "Leich" or challenging the bet of the previous player. If a bet is challenged all players vote on this bet by simultaneously showing a "thumbs up or down". Those choosing "thumb up" believe in the bet, those with their thumb down disbelieve it. The cards are then revealed and the players who guessed correctly discard their card, the other players take back the card and place it as the last card in their deck. Twice in the game each player has the opportunity to ask two players to show him/her their card. This must happen before a bet is challenged, though. The game ends once a player has discarded all of his/her six cards. If all of this sounds familiar: yes, the principle is very similar to "Liar's Dice" or "Bluff" as it is called in Germany. In comparison, we much prefer Bluff - it plays faster and is a bit more predictable with respect to the odds, and last but not least the suspense of the fact that the number of dice (and players!) is constantly reduced is unsurpassed. After having some extreme results regarding the number of dice showing the same value last time round, this round was more of the usual matter. Our first round was slightly off the usual as it showed an surprisingly fast reduction of dice during the first few turns.